The Honda Urban EV concept was one of the most popular concept cars at the 2017 Frankfurt Motor Show, and at this year’s Geneva show, Honda will preview the production model. The Lexus UX is a small SUV with a premium badge, meaning it competes with desirable rivals like the Audi Q3, BMW X1 and Mercedes-Benz GLA. Chris Grayling will unveil plans to increase the number of ultra-low emissions vehicles on the road. While it seems like everyone wants to be driving an SUV these days, the humble estate car still definitely has its place on UK roads. For starters, it's perfect for camping, as this week's REV Test shows. Electric motoring can be expensive, but it doesn’t always have to be. 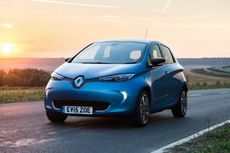 Here, we pick out the most affordable electric car options for people who have both an environmental conscience and a limited budget. Don’t just top up your electric car when you’re at home. There are plenty of options to charge while out and about, too. If you're planning to drive further than your EV will take you on one charge, what are your options?